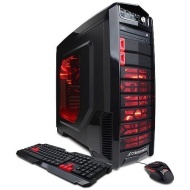 alaTest has collected and analyzed 19 reviews of CyberPowerPC Gamer Xtreme GXI1000W. The average rating for this product is 4.5/5, compared to an average rating of 4.2/5 for other Desktops for all reviews. Views about the design and reliability are generally positive. The price and size also get good views, whereas some have doubts about the usability. We analyzed user and expert ratings, product age and more factors. Compared to other Desktops the CyberPowerPC Gamer Xtreme GXI1000W is awarded an overall alaScore™ of 87/100 = Very good quality. I would urge anyone considering this Big PC for the PC gamer in their life, to closely check the product dimensions. When I did, I had to reconsider its location. My grandson is very pleased with this PC however. No problem so far. My son has been playing many hours a day and he is very happy with this computer. Easy set up. Back to where I left off on my old PC in no time fast. For the price ...an excellent deal. I just received mine last week and fell in love with it.I would only suggest get a better psu and graphics card.The case is plenty big so you can upgrade whenever you want.A great gaming machine. The computer was much larger than expected. For a real true gamer, it is perfect. Plenty of room to add more gaming boards. It was disappointing that there was no hookup and had to spend $40 more to hook up to the monitor.